Many women are dissatisfied with their body after a childbirth. Usually during pregnancy women gain 15 to 30 lbs, their abdominal muscles lose strength and their skin is less elastic. New moms often ask how to get their body back after pregnancy. There are few ways to lose extra pounds. The most important thing is to listen to our body and not to overload it. First of all, new moms should know that breastfeeding helps losing weight. Besides during first six months after birth mother’s body is actually helping in weight loss. After that women have to start a physical activity or a diet to lose more pounds. Going for walks with the baby is one way of exercising and losing weight. If you want to go out with your child you need a stroller for that, which will provide you and your baby with a safe and comfy ride. The stroller should be easy to use and convenient to push. Very useful feature is an adjustable handlebar (essential for very tall or short parents). Your baby should lie comfortably in a bassinet or sit in a toddler seat with 5-point harness. You can stroll with your baby actually right after birth. Your baby have to lie in proper position: in a bassinet or infant car seat. Modern strollers like travel systems consists of a frame and many add-ons (like bassinet, matching infant car seat and toddler seat), so we can use them since day day for at least few years and use different seat, depending on our needs. If you want to go for a walk not only to the city center but also to woods or use it on unpaved gravel roads, you should choose a stroller with big all-terrain wheels and proper suspension. We don’t want our baby to get bumped around! 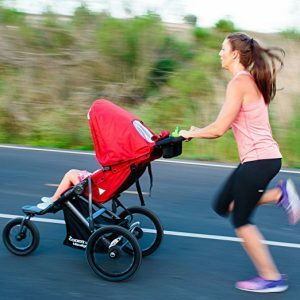 If you like jogging you can also run with a baby sleeping in a stroller, but you will need for that a special stroller which is called jogger. It is specially designed for running with babies (from 6 months), has proper suspension and safety features. Another great way to lose extra pounds after pregnancy is swimming and fitness classes. The latter is also great way to spend time with friends and take a break from home responsibilities. Diet is also important thing. After a childbirth women don’t have to eat twice much, really 🙂 But they should carefully consider what they are eating. Especially if you are breastfeeding your diet should include lot of proteins, iron and calcium and other vitamins. You should eat plenty of fruits and vegetables and avoid sweets. Thanks to properly chosen diet and proper number of exercises new moms can get their body back pretty quickly.